Sosoliso Airlines flight 1145 was scheduled to depart Abuja (ABV) for Port Harcourt (PHC) at 10:00, but the flight was delayed to 13:26. At 13:41 the flight contacted Port Harcourt while maintaining FL240. The approach controller then gave the flight an in-bound clearance for an ILS approach to runway 21. About 13:50, the crew contacted Approach Control for initial descent clearance and was cleared down to FL160. The aircraft continued its descent until about 14:00 hours when the crew asked Approach Control whether it was raining to which the controller reported negative rain but scattered CB and the crew acknowledged. At 14:04, the crew reported established on the glide slope and the localizer at 8 nautical miles to touch down. Then the Approach controller informed the aircraft of precipitation approaching the airport from the direction of runway 21 and passed the aircraft to the Tower controller for landing instructions. The flight contacted Port Harcourt Tower and reported established on glide slope and localizer at 6 nautical miles to touch down. The controller then cleared the airplane to land on runway 21 but to exercise caution as the runway surface was slightly wet and the pilot acknowledged. On final approach, the flight encountered adverse weather with wind speed and direction changing from 220 deg/09 kts to 360 deg/05 kts. successful. The aircraft continued until the tail section contacted the grass area between runway 21 and a taxiway, 70 metres to the left of the runway edge and 540 metres from the runway threshold. Some 60 m further on, the rear fuselage impacted an exposed concrete drainage culvert. The no. 2 engine was sheared off and the rear airstair broke away from the fuselage. The aircraft disintegrated and caught fire, skidding for another 790 m. The cockpit section with the forward fuselage was found a further 330 m from the rest of the wreckage trail on the taxiway, giving a total wreckage distance of 1120 m.
PROBABLE CAUSE: "The probable cause of the accident was the crew's decision to continue the approach beyond the Decision Altitude without having the runway and/or airport in sight. 1. The crew's delayed decision to carry out a missed approach and the application of improper procedure while executing the go-around. 2. The aircraft encountered adverse weather conditions with the ingredients of wind shear activity on approach. 3. The reducing visibility in thunderstorm and rain as at the time the aircraft came in to land was also a contributory factor to the accident. And the fact the airfield lightings were not on may also have impaired the pilot from sighting the runway. 4. Another contributory factor was the fact that the aircraft had an impact with the exposed drainage concrete culvert which led to its disintegration and subsequent fire outbreak." Where the training captains of Nigerian operators\' conduct simulator training for their pilots at overseas institutions, the final check should be carried out and certified by instructors designated or appointed by the host country\'s Civil Aviation Authority for transparency. Pilots flying into Port Harcourt and other coastal areas in the country should be mindful of weather hazards such as wibd shear activity. Recognition and recovery from adverse weather/wind shear should be mandatory part of pilot\'s initial and recurrent simulator trainings. NIMET should provide appropriate equipment to generate data on visibility and cloud conditions near the runway threshold and also ensure that adequately equipped briefing office is provided at the airport (and in all airports) for en route weather information among others. There should be provision of on board wind shear detection /monitoring equipment and also at the airfield. There is also the need to carry out further studies into wind shear phenomenon at the airports. There is the need for the provision of Uninterrupted Power Supply UPS) to the airfield lightings to ensure that all critical aids are on throughout the operational period of the airport. If this can not be achieved, the operational hours should be reduced/modified. The airfield lightings presently under FAAN Electrical Department Should be transferred to NAMA so as to be regulated at the Control Tower in case of pilot\'s request for lighting intensity adjustment. Hence, the airfield lighting control at the tower should be reactivated. This is because the situation where controllers have to contact the FAAN Electrical Department to switch on or control the intensity of the airfield lightings is unacceptable and is not in consonance with the recommended practice. 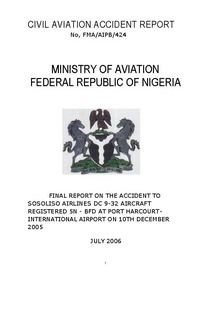 The Airport Emergency Plan should be well structured and periodically tested with all the various agencies (FAAN, NAMA, City Hospitals, and Red (\'rots etc) participating, Adequate fire cover should be provided at the airport (Category 8) otherwise, it should be appropriately graded. Airline operators should be required to equip their aircraft with DFDR that is capable of reading several parameters (minimum of 32), and solid state CVR for enhanced recording. The Nigerian Civil Aviation Authority, NCAA should monitor and strictly enforce standards on airfield lightings, fire cover and aviation personnel training. Distance from Abuja International Airport to Port Harcourt Airport as the crow flies is 443 km (277 miles).